Sensei's Writings The Teapot I Found in Tehran; Reflections on My Visit to Iran. I am not a priest or a politician. Nor am I an activist. I could be described as one who makes dust by repeatedly hitting the mat. That’s what my family used to say anyway. When I told people that I was going to Iran, my statement was usually met with wide eyed shock. “What!! Why?” was a common response. Honestly I too was a little nervous. Most news reports I had seen on Iran here in the United States were not very positive. News reports on the major networks talked of nuclear armament, military supplies in other countries, humanitarianproblems, sanctions against Iran etc. Not the most supportive commentary by any means. As I packed to leave Istanbul for Tehran, I found myself repacking several times. I was trying to make sure I had everything correct and did not take anything that was not absolutely necessary. I copied all the photos I had taken so far on this trip to CD’s to make sure the chips were empty if they were confiscated. I left behind all the books I had brought with me and any other printed information I had gathered from other places along the way. I left behind extra batteries, my flashlight and all other travel accessories. All my shorts and short-sleeve shirts I also left behind along with medicines. I have dogtags with all my pertinent emergency information on them, but these I took off too. Someone in Istanbul had joked that if I got my head cut off, the dog tags would fall off anyway! I knew it was a joke, but just in case, I took them off and tucked them deep into one of my lightly packed bags. I guess I was thinking I had better travel light, just in case… I finally headed to the airport dressed in a summer suit that smelled faintly of moth balls, it had been so long since I had worn it. From the very first Iranian person I met on my journey to Iran, I sensed that the information in the guidebook was wrong. I had overdressed to start with, and the summer suit I was wearing looked out of place as I lined up to check in before entering the plane. While I did see a few women dressed in native burka, the men I encountered were dressed neatly but much more casually than I had expected. I casually removed my jacket and rolled up my sleeves so that I might fit in a little better. 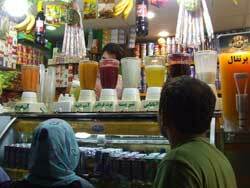 I found I was experiencing my first culture shock about Iran and I hadn’t even left the ground. As I boarded the plane,my overdressing suspicions were confirmed. All the men were dressed fairly casually with short sleeve shirts and some of the women on the plane did not have their heads covered. The dress code on the plane seemed similar to other Muslim countries I had visited where dress was more personal choice than mandate. Many women were wearing a “manto” (a coat-like over garment) which they removed once the plane had taken off . These mantos were short, cut above the knees, and were worn over a top and a pair of pants or even jeans. The women used scarves to cover their hair, but in a more fashionable than restrictive way around their necks and shoulders. Some of the older or more traditional women were wearing chadore (burka like garments). As the plane began to descend in preparation for landing, the women covered their hair with scarves and the men straightened their collars; all looking well cared for, clean, pressed, crisp and fresh. Compared to travelers I have met wearing sloppy shorts, ragged t-shirts and sandals, everyone on the plane to Tehran looked well groomed and well kempt. After landing in Tehran we deplaned and headed for immigration. The officer on duty was a woman and wearing a chadore (burka). If one had never been to a Muslim country before, this might have looked a little surprising. But for this part of the world it did not seem out of the ordinary at all. In Iran, this type of clothing is worn as part of their religious tradition. This was nothing unusual for me as many countries I’ve visited have different traditional clothing worn for religious reasons. Tackling the subject of women’s clothing as symbols of repression requires addressing the traditions in many, many countries around the world. In Christian countries, it is not unusual to see “women of the cloth” wearing habits that cover their hair and bodies, so it was not that surprising to me to see a women wearing a chadore working in Immigration at the Tehran airport. We were in Iran, and in this country, these are the rules. Any references or judgments on the rights or liberation of women using a Western measure are not fair. Iran’s traditions and religious practices are the rules of this country. Every country has rules that must be adhered to, some more strict than this. Japan for instance has a LOT of social codes and rules of dress and manners. For example in Japan, at most schools, boys wear black uniforms and girls wear sailor styled uniforms that are old fashioned by today’s standards. Boys have crew cut hairstyles, skirt lengths for girls can only be so short, all shirts must be tucked in at all times and no more than one shirt button may be unbuttoned. Any infraction of these rules can result in suspension from school. The rules are very strict and carry on after graduation. New members of the Japanese business workforce also have a dress code by which they must abide. The gray suite “recruit look” is mandatory if someone is truly interested in getting a prospective job. In the summer months, businessmen and women wear “sho ene” look, or “clothing that saves energy” using lighter materials that require less energy to cool office buildings. Adults, while having the ability to choose their attire must also abide by rules of dress. It is difficult in Japan not to conform to society norms. At funerals men wear black suites and black neckties. Women wear black too adorned with pearls. Rules of dress are not law in Japan, but are customary and expected and compliance is expected. Since there are rules of dress in the country I am from, how can I say anything about the rules of dress in another country? 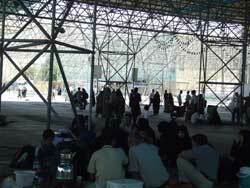 There were no baggage checks at customs in the Tehran airport for Iranian people. Foreigners such as myself had their bags put through an old x-ray machine. The customs officer waved everyone through without even looking. I felt like a puppy invited into a room I was trained not to enter. I was a little hesitant as I walked past the agents, waiting to be swatted with a rolled up newspaper. Now that I think about it, that was one of the easiest customs inspections I have been through anywhere in the world. It made me wonder where the guidebook got the information that your bags will be searched from top to bottom! Coming from the USA where security checks are the most severe, I had been overly anxious of this procedure to enter Iran. 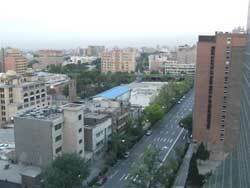 View from the hotel of downtown Tehran. Farshad was waiting for me in the airport. I had imagined that men too in Iran would be clothed in native dress, but everyone was dressed very similarly to the men in neighboring Turkey where I had just come. 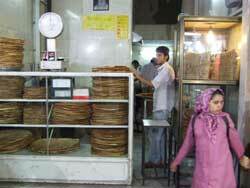 The city of Tehran also seemed similar to other newly reconstructed cities I have visited. Since the relations between Iran and United States are strained at the moment, I did not see any American cars, but I did see plenty of very nice Japanese, French and other European automobiles. I did not see any cars without bumpers or dented bodies or windows covered with plastic and duct tape. There were a lot of yellow cabs on the streets, so getting around seemed convenient. Motorcycles and bicycles added to the mix, but the streets seemed orderly. The one problem I would soon learn about was the problem with the availability of gasoline. (Yes, I know that Iran is an oil-producing country, but refined gasoline is a problem.) All motorists are on gas rations of 3.3 liters per-car, per-day. One liter of gas in Iran costs about 12 cents. Gas prices in Iran had increased dramatically from 3 cents a liter, but compared to $1.40 US per liter in Japan, it’s a lot cheaper here. This made sense, I thought as I reflected on the developed nations trying to use food sources like corn to run their cars. Maybe we should try a rationing system like Iran. It would be an interesting idea to try anyway. Personally, I don’t drive, it is not my greatest priority or concern. No American flag in the hotel reception area. 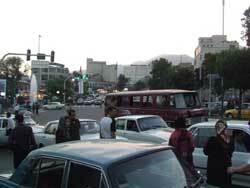 My hotel was located very close to the old American Embassy; made famous during the Iran hostage crisis in 1979. It was grand and statuesque, and has been in business since well before 1979. 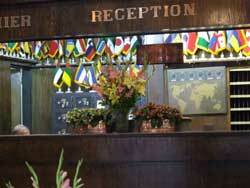 As I was checking in I studied the lobby, noticing a display of flags of the world. I looked more closely at the flags, and noticed that there was no American flag on display. I turned over my Japanese passport at the desk and was told that my passport would be held until I checked out. These were the rules, and I did not ask if there were any exceptions. I asked gently “Where is the American flag in your display?” The nice looking gentleman clerks looked at each other, not quite sure how to answer. In beautifully spoken English, they finally replied, “That flag we keep here,” gesturing toward their hearts. I thought this was a very deep answer; positive or negative I was not sure. Looking back at the flags, where the American flag did not stand, I did not feel anger, but sadness. In front of the dojo with Ali Sensei. 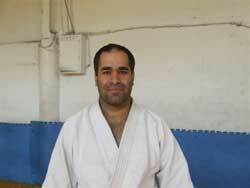 The Founder of Iran Aikido, Ali Aghsaghloo Sensei, was born in 1966 and is now 41 years old. 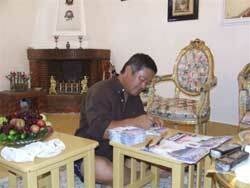 In 1990, Ali Sensei worked in Japan for a famous Japanese metal company. While he was living in Japan, he made friends with a Japanese crane operator who took very good care of him. One day, while visiting his new friend’s home, he noticed for the first time akeiko gi hanging out to dry. This was his first introduction to Aikido. Before Ali Sensei had come to Japan he had practiced Kung Fu and Tae Kwon Do, so he was interested when invited to visit Chigusa Dojo where his friend practiced Aikido with Yoshida Shihan of Aikido Kobayashi Dojo. 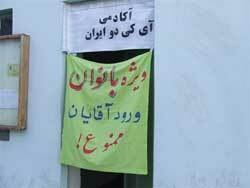 At that time there were many Iranians who had come to Japan looking for work. Along with many hard-working Iranians came a criminal element that soon tarnished the reputation of all people from Iran in Japan. This was a sad consequence for the Iranians who sincerely liked being in Japan and worked very hard. 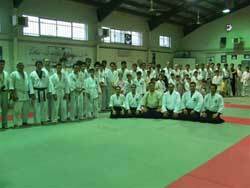 In Chigusa Dojo, Ali Sensei was the first foreign student. He was also the only Iranian foreign student, and his Japanese friend had to vouch for him to gain entrance into the dojo. From that day on, early in the mornings before work, after work, days off, every day they could, they came to practice. 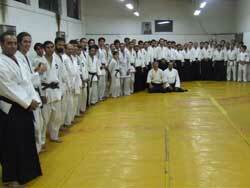 In 1993 through Aikido Kobayashi dojo, under Yasuo Kobayashi Shihan, Ali Sensei earned the rank of Shodan. In 1995 he earned the rank of Nidan, and it was not long after in 1998 that he earned the rank of Sandan. All examinations were held at Aikikai Hombu dojo in Tokyo. 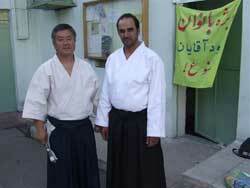 In September 1998, Ali Sensei returned to Iran where he currently holds the Aikikai rank ofYondan. 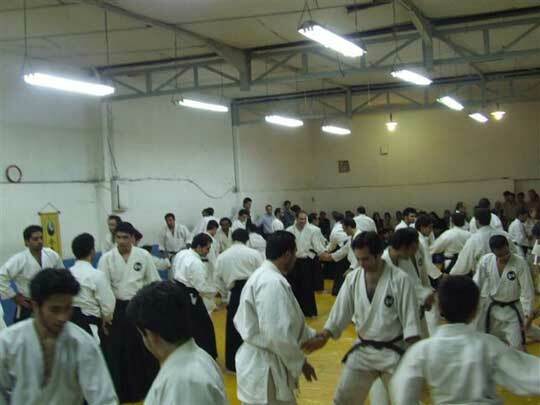 In Tehran, Ali Sensei’s organization has over 25 dojos. 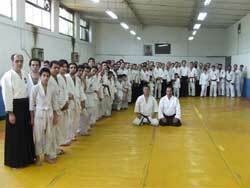 Ali Sensei told me that there are about 6,000 people practicing Aikido in Iran today. Outside gate of Ali Sensei’s Dojo. When I met Ali Sensei, he had just returned from a trip to Mecca, a long standing-dream for people Muslim faith. He seemed in very good spirits after making this journey. He told me that his next goal was to return to the university to work on his graduate degree in Japanese language. His dream is to translate Japanese history and Aikido-related books directly from Japanese. He said he worried that if books were translated from Japanese into English and then into Iranian languages that there would be too many chances for mistranslation or loss of original content. “A person that drinks Muslim water translating directly from Japanese to Iranian languages is what I want to do.” I could feel in his words a great determination and sense of purpose. At Ali Sensei’s dojo, I met many students who had practiced in Japan and spoke Japanese very well. As I listened to them speak Japanese I noted that the tenses they used indicated that they were highly educated and their Japanese skills were quite refined. Many of them spoke of their experiences in Japan. “We all studied Japanese very hard but in Chiba or Ibaragi or Tochigi prefectures where we went to work, our language skills were almost useless. There they spoke local dialects so heavily we could not understand at all!” they said with a laugh. I knew exactly what they were talking about. I am from Akita in Northern Japan where the local dialects are very strong. We could laugh together at this predicament. All the students I met who had been to Japan and spoke Japanese, told me how much they loved Japan, and would like to go back if weren’t for the obligations they had to their wives and children, and parents. When they spoke of Japan their faces lit up and they smiled sincerely at their fond memories of my homeland. 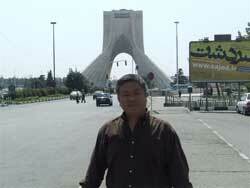 Mr. Soltani, lived in Japan for 13 years. Why does he practice Aikido? Because he loves Japan. Mr. Mirza, lived in Japan for 7 years where he began his practice of Aikido. 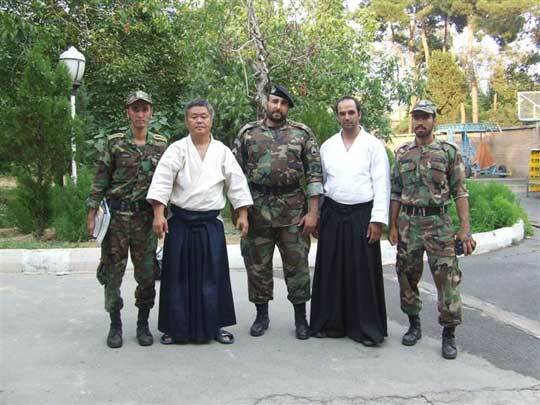 I think that it would be in the best interest of the Japanese government to support these Iranians in their Aikido teaching and their positive message about Japan and Japanese culture. This is a positive step in world communication and is an opportunity to build upon a good relationship between the people of Iran and Japan at the local community level. The practice of Aikido, as it’s utilized in many parts of the world, can be a vehicle for peaceful relationships between people and their home countries. 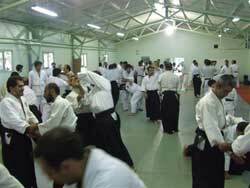 Japanese Embassy leaders in Iran should support these people directly in their efforts to bring Aikido and Japanese culture to their country at a local level. This is a task that Hombu headquarters in Japan cannot accomplish alone. Diplomatic assistance could be a wonderful tool of support. 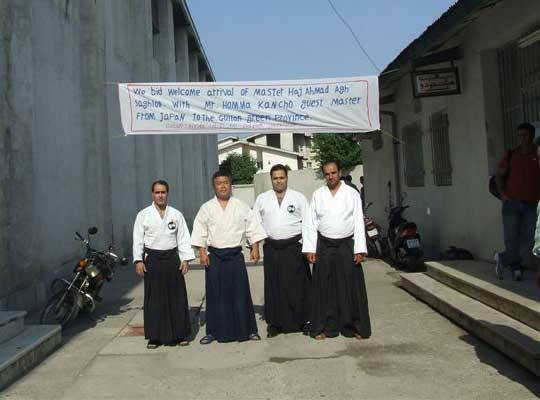 Ali Sensei and the instructors that teach Aikido along with him, hold Japan and Japanese culture in high esteem and have the attention of over 6,000 students in Iran. Aikido does not have tournaments, therefore it does not attract worldwide attention in the same way that International Olympic events or international sports competitions do. Aikido could be a good activity for the Japanese government to support internationally to promote cross-cultural exchange because it has no competition, winner or losers. It could be a well-suited venue for a higher level of government support. Curtained entrance to the dojo stating: Women’s practice in session. Men do not enter. Ali Sensei’s dojo is located in the Meat Industries Union Recreation center. There are classes held here from morning until night. For larger class events he uses the wrestling gymnasium. As chance would have it, when I visited Ali Sensei’s dojo, a women’s Aikido practice was in session. 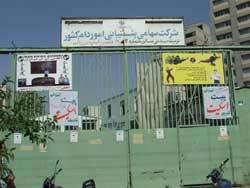 In Iran, men and women train separately, and the only men allowed in the building during the women’s classes are the instructors teaching class. Ali Sensei’s wife Fateme usually teaches the women’s classes, but since I hold the title of Sensei I had permission and the opportunity to teach the women’s class. Since there were no men present except me and Ali Sensei, most of the young girls and women practiced without wearing a scarf to cover their hair. We had a very good practice together, and after class we took many photos. In respect for Iranian religious custom, I have not included any of the photos of the women’s practice because the women were not wearing their traditional scarves. I am sorry not to use any of the photos. All the women that attended practice that day were beautiful, strong, healthy women with impeccable manners and practice etiquette. On the first day of men’s practice, Ali Sensei’s students, other groups of students and their instructors under Ali Sensei’s supervision came to practice at intervals. They changed places on the mat and practice continued for four hours. The following day was structured in the same way for a two-and-a-half hour practice session. 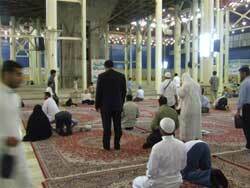 Friday is a “day off” from work in Iran, so a three-hour rotating practice was held that day. In all, about 300 students practiced over the three-day period. I spoke to Ali Sensei: “You have a lot of students and a lot of branch dojos under your control, your financial foundation must be very stable.” Ali Sensei laughed and said “No way, Jose! The student fees run about $16US per month. After paying for my own very meager living expenses, most of this money is spent on advertising. Yes I have a lot of branch dojos, but these instructors need to make a living too. They have expenses of their own to cover, and families of their own to support. 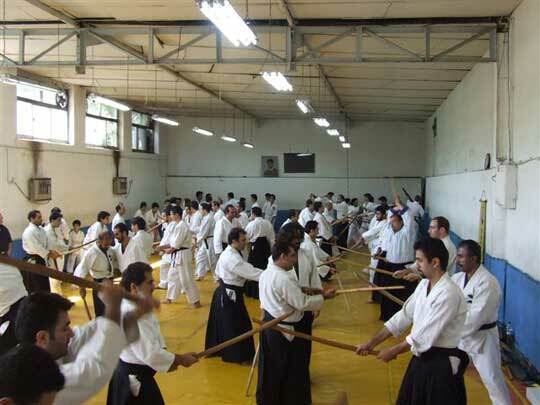 I do not encourage payment made to me from my branch instructors; they must take care of their own.” Currently Ali Sensei’s goal is to introduce Aikido to Iran and form a strong Iran Aikikai foundation. This is his first consideration. A steady source of income is not a priority for Ali Sensei who regularly loans his students the funds for their required Aikikai Shodan examination registration fees. “I have supported many students with funds for their examinations through a loan payment system I have created. A regular policeman’s salary is about $300US per month. Most of my students can’t pay the required Shodan exam registration fees required by Hombu, and still have money left to pay their monthly living expenses. If I were just thinking of a business to make money, I would not have chosen Aikido. I teach and practice Aikido because I love it. That is why I do this.” I believe his kind of attitude, kindness and care for his students is a big factor in Ali Sensei’s success in Iran. So many students for one class, we split into two groups. I tried my best to experience the wider Iranian community and took every opportunity to see more of this country and its people. I wanted to experience the local lifestyle, so I asked a student named Amir, an electronics businessman, if I could accompany him to the local markets. Amir took me in his new Suzuki automobile to a very crowded local bazaar followed by a wonderful dinner at a garden restaurant outside of Tehran. 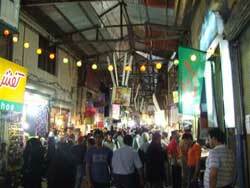 The bustling bazaar was similar in feel to bazaars I’ve visited in other countries. 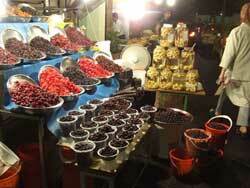 There were stands selling an abundance of vegetables, fruits, olives and countless other prepared foods. 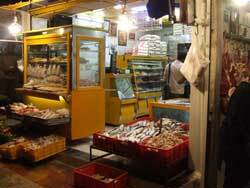 The meat and fish shops were clean and organized with a very healthy feeling. 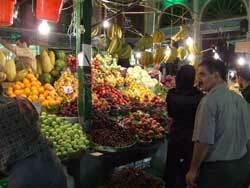 The bazaar was alive and thriving! For our meal together we drove about 40 minutes into the mountains on a well-maintained highway. There were many garden restaurants lining a mountain creek nestled among tall groves of trees. It was after 10:00 pm., yet all of the restaurants were full of families enjoying the fresh mountain air and the delicious foods being served. It was Thursday in Iran, which is the beginning of their weekends. 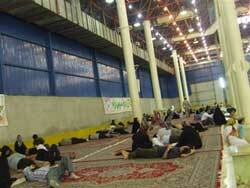 Friday in Iran is a day of rest like Sunday in the United States. 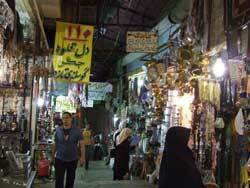 The bazaar in Tehran was powerfully alive! The following day we practiced in the morning and then all went to a lunch buffet. Ali Sensei and I were driven by a student who drove a Mazda, who I could tell liked the power and the speed of his shiny new car! I watched him maneuver through the busy streets until I finally I spoke up. “Wow” I said, “You are a very fast driver! Won’t you get a ticket if you get caught speeding?” Ali Sensei sitting behind me in the back seat just smiled. The young driver said in return, “Don’t worry, I am okay. If I should be given a ticket I will write it myself!” He reached over to open the glove compartment which contained a book of tickets and an official police auto dome light and other police equipment. With surprise, I found out that he was actually a policeman himself and that this year alone had been called to duty on many occasions to serve with the Tehran Special Action SWAT Police during serious emergencies. As I looked at him again, I noticed that he had multiple scars on his muscular body from knife wounds. He said with an intimidating smile, “The biggest mystery is that I am still alive!” I found him to be a kind man however, one that gave coins to the boys that asked to wash your windows at stop lights or to the girls selling matches. I regret that I cannot include his photo with this article, but it would be best in his position for it not to be shown. In front of the Khomeyni Armangah Mosque. After brunch, we visited a monument to the beginning of Persia, 2,500 years ago. The name of the monument was Borj-e Azadi tower and was built in 1971. 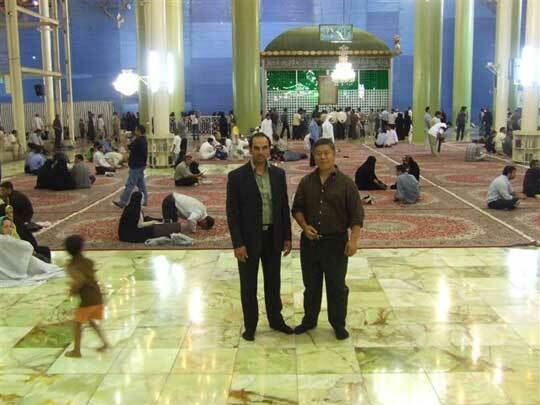 We also visited the gravesite and mosque where Iran liberation leader Aramgah-e Emam Khomeyni was laid to rest. This grand mosque is currently undergoing reconstruction. In front of the mosque, there were many families sitting out on carpets relaxing, whiling away the afternoon cooking kabobs over small burners or making tea. I do not think you would ever see families having picnics in front of churches in Europe, but for me it was a familiar scene. Families in Japan often enjoy a picnic lunch or dinner in front of shrines or village monuments and statues; the purpose being to share their time with family members who have already passed on. Families gathering outside of Khomeyni Mosque. I am not a Muslim, and was concerned that my entering the mosque might be bad manners. Out of respect, I tried gently decling entering with Ali Sensei. “Don’t worry” I was reassured, “Everyone is welcome to enter here” Ali Sensei said as he invited me inside. I was shown how to correctly perform the ceremony called Daret, by washing my hands, mouth and feet before we entered the mosque. I was surprised to find that I was free to take photos inside. There was an area for women only to pray, but most of the space was reserved as an area for men and women to pray together. Between prayers, people were reclining naturally on the carpets, sometimes napping, sometimes playing with the children that were running to and fro between the devotees. “Wont the children be scolded fro playing in here?” I asked. “This is a family place” came as the answer to my question. The scene around me was unusual in my experiences of religious places. Ali Sensei and the policeman faded away from me to join the others in prayer and I found myself standing alone. I felt very alone at that moment but also felt as if I was being watched from afar. (I am a martial artist after all.) It was not long after Ali Sensei parted my company before I was approached by someone else who asked me what country I can come from in English. I told him I was from Japan. After he discovered that my country of origin was Japan, he smiled and said “Welcome” and soon left. After he departed, that sense of being watched vanished. Looking around, I did not see any Chinese, Japanese or Korean faces around me. I assumed I was an unusual site for the security force and was worth investigating. Luckily he seemed happy to hear that I was Japanese. Ali Sensei in prayer (center). Between prayers, families relax together. 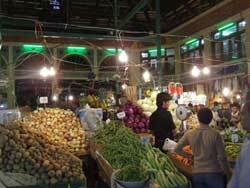 On Saturday, Ali Sensei and I flew on a one-day trip to the city of Rasht near the Caspian Sea. Local instructor Bahram Jafari Pour Sensei was at the airport to meet us. Pour Sensei was accompanied by a man named Moglebelan who had worked in Japan as a mason for 10 years. Mr. Moglebelan had been successful in Japan and had saved enough of his earnings there to afford a good life back in Iran. On the drive from the airport, I noticed that the scenery and feel of Rasht was a little different than Tehran. The people seemed a little more open and relaxed with more a “country” feel. Before evening practice we had time to see the local historical sights outside of Rasht. It was interesting in that I was the tourist viewing the sites, but here I was also a tourist attraction and the object of curiosity amongst other locals and site seers. I was attracting attention and it was a little embarrassing! Mr. Moglbelan informed other onlookers that I was Japanese and this seemed to make everyone smile. One person even shook my hand. I could tell that the people who had gathered around me were “country folk” and I was not sure how much actual information they had received about Japan. It was apparent however that even if they had only minimal information about Japan it was positive. With just small pieces of positive information, the whole group had a good impression of Japan. Like the ripples a pebble causes when dropped into a lake, a wave of good information (or bad for that matter) ripples outward, touching the most far away regions. Especially, in a country where sources of information are controlled, the smallest images can have a great effect on people’s opinions. One wrong image can form the wrong opinion in someone’s mind. That these country folks smiled at hearing that I was Japanese was a reflection on the influence Ali Sensei and students like Mr. Moglbelan had on the local community. Ali Sensei and his students were shin nichi ka (a group of people with positive things to say about Japan). I appreciated their efforts at that moment in Rasht, Iran. 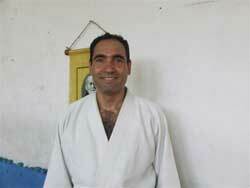 Bahram Sensei used to practice karate, but three years ago changed his practice to Aikido. To do this, he went to Ali Sensei in Tehran. Every Wednesday, Bahram Sensei hops on the night bus for a seven-hour ride to the central station in Tehran, and another one hour bus ride to Ali Sensei’s dojo. There he waits another hour outside the dojo for classes to begin. After class the same evening he catches the bus back to Rasht. Bahram Sensei has done this every week for the last three years. This kind of dedication and effort marks the character of someone who can open their own dojo of which he has done in Rasht. It was a long time before Ali Sensei discovered that Bahram Sensei had been waiting outside his dojo for an hour before the doors opened. Even in the dead of winter he would wait in the cold so that he could practice Aikido. 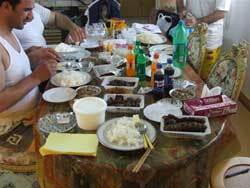 Bahram Sensei had lunch prepared for us at his home. As soon as we entered his house, he told us that the women had been sent away so that I could relax and not worry. He took off his slacks and made himself comfortable in a pair of shorts and tank top. More people arrived, making themselves comfortable in undershirts and shorts. Even I, for the first time since I had come to Iran, put on a pair of shorts. The house was cool with air conditioning and there was a large flat-screen TV in the living room. There was a large 200 square foot, fully equipped kitchen where lunch was prepared. The house was decorated with beautiful Persian carpets and Persian-styled furniture. 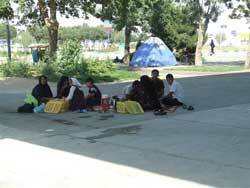 Soon there were fresh kabobs, salad, yogurt and other delicacies served. All of the men had their lunch together. After lunch, Bahram Sensei brought set of sheets and pillows to the living and everyone settled down for an after-lunch nap! When I awoke, Ali Sensei and the others were asleep on the floor around me. While kind of an unusual experience for me, it seemed natural here and was a nice time to relax. Definitely a “man’s world.” I think Bahram Sensei asked the women to go elsewhere for the afternoon as part of his best hospitality; offering an environment where the men could be more relaxed among themselves. Delivered lunch; plentiful and delicious! Signing 300 autographs in Bahram Sensei’s home. 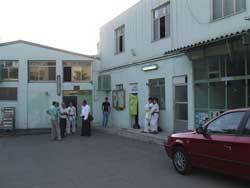 The dojo in Rasht was located in government-operated gymnasium. The bleachers were full of family members waiting as we arrived. There were local officials and celebrities seat in the front rows of the bleachers and there was an air of excitement in the air. 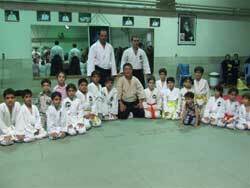 Over 80 students attended class that day including some students who practice Judo and Karate. All were innocent and earnest in their practice. We held a three-hour practice, and everyone practiced hard, working up quite a sweat. Annual time for friendship and communication. 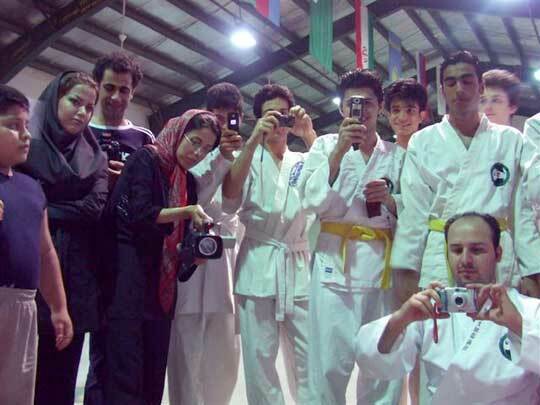 Everyone in Iran loved to take photos, and we posed for photos for at least 30 minutes after practice. 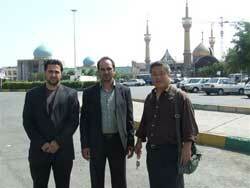 Finally it was time to say goodbye, and Ali Sensei and I made our way back by plane to Tehran. Many thanks to Bahram Sensei, Mr. Moglebelan, and all of the Rasht Aikidoka for the warm welcome. Please take good care and I sincerely thank you. The next day was Sunday, and there was an unexpected change in my schedule. Ali Sensei told me to be dressed and ready in the hotel lobby at 8:00 am. I changed into my keiko gi and went to the lobby to wait, not quite sure what was going to happen next. The Iran Special Combat Forces in Iran are the fiercest members of the Iran Military and had quite a commanding presence. Even the hotel staff was a bit nervous at the soldier’s presence at the hotel, wondering if they had done something wrong! The former American Embassy is very close to the hotel, but a special car had been sent and was waiting to drive me. With military personnel inside the former American Embassy. I entered the former American Embassy where the Iran Hostage Crisis played out in 1979. This was the first spark, I reflected as I walked, that ignited the tense relations between Iran and United States. This is where it had all begun. The walls surrounding the former American Embassy are now covered with anti-American slogans and the complex is under heavy security. Cameras monitor constantly as people passed by, rotating to follow them as they walked. I cannot describe what was going on inside the Embassy to protect the trust that was placed in my by being allowed to enter. The only photos I can show are the photos I had permission to take inside the dojo where Judo and Aikido are taught. There were about 70 students attending class that Sunday morning. As usual when I am teaching a new group of students, I asked them what they were interested in learning and built a class curriculum from their requests. Three techniques were requested; jujinage, koshinage, and iriminage. From this repertoire, I built a class with several variations of these techniques moving from one technique into the next in a progressive series. Practice inside the former American Embassy. After practice, I was escorted back to the waiting military vehicle for the ride back to the hotel. Most of the students gathered outside to wave farewell and thank you. The military vehicle entered the VIP lane of the road to the hotel, going the most direct route; backward against traffic without stopping at traffic signals. It did not take me long to arrive at the hotel. As I got out of the vehicle the commander of this military unit stood in salute until I had entered the building. As you can imagine, after this morning episode I was treated like royalty by the hotel staff! Dinner at Ali Sensei’s home. Center: Ali Sensei, Right: Mr. Rashad. 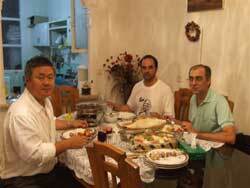 On my last evening in Iran, I went to Ali Sensei’s home for dinner. We had a wonderful evening together talking about Aikido, Japan and other related topics. I found it a little difficult to answer Ali Sensei’s questions about my personal experiences with the Founder, Morihei Ueshiba. The information that Ali Sensei has about the Founder he learned from books, and the image of the Founder has been distorted by fictionalized reports in many books and films. His questions were based on a fictional portrayal so it was difficult to answer his questions with what I knew from actual experience. This brings an end to my story about Iran. It is not complete, I could write volumes but I must stop here. Some might think that I have only written about the positive experiences I had in Iran. Yes, that is true, I have written about the beauty of the towns and cities I visited. I have written about the cleanliness; I saw no hamburger wrappers or trash in the streets. I have written about the people I met; I saw no bums panhandling on the corners, or youth with loud music blasting inside their heads through iPods, or tattoos and piercings or pants that hung low down peoples’ behinds. I do not believe I have any business commenting on the way people live their lives at home anywhere in the world. I am a traveler, and was honored to have this opportunity to share in these peoples lives. There are negative sides to any place, but I am not looking for the negative to write about in this article; that was not my experience. Iran in my experience was a moral and clean place to live. I realize that there were many controls in place to maintain this type of general mind set, and there were strict guidelines that had to be followed. We have this too in Japan. To protect public morality and safety in Japan we have the omawarisan (public safety police) and thekoban (neighborhood police box or stations) who also keep Japan as one of the safest countries in the world. Other countries I have visited are stricter in their social codes than Iran, so to single out Iran is not fair or correct. Anyone with common sense and a sense of morality and respect will find Iran to be a nice country. Nuclear armament issues and human rights issues are topics on the evening news. If we judge the Iranian people by only the negative things we hear we will never have a chance to know them, or fix the problems between Iran and the world. This is our challenge to look inside. I found this teapot in Tehran. Please look at it again closely. It should at least make you smile. 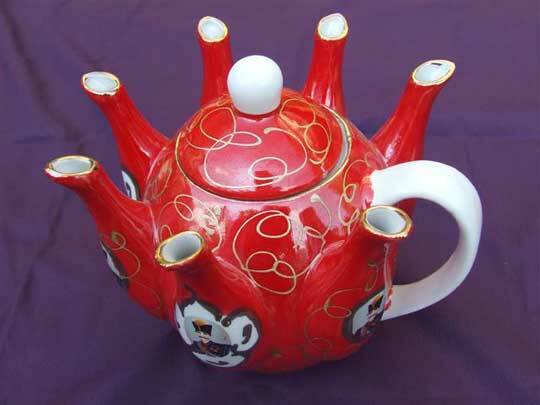 It is a teapot, but how do we use this teapot? Which spout do we pour from? Actually, only the spout directly across from the handle is connected to the inside of the pot. IF YOU LOOK INSIDE it is simple to see that the other spouts are not connected; only one spout is real. We need to take a close look at Iran on the inside, and not be confused by the “extra spouts” that are portrayed to us. I too will watch the future relationship between Iran and the world, but with a very calm eye.